When I was orbiting Earth in the space shuttle, I could float over to a window and gaze down at the delicate white clouds, brilliant orange deserts, and sparkling blue water of the planet below. I could see the coral reefs in the oceans, fertile farmlands in the valleys, and twinkling city lights beneath the clouds. Even from space, it is obvious that Earth is a living planet. The view from the space shuttle's window inspired Sally Ride to start EarthKAM. She wanted students all over the world to share the incredible learning experience of observing our planet from space. Explore these topics and activities with your students to prepare them to get the most from their EarthKAM mission. Learn about Earth's oceans, land, atmosphere, and living things, and how they interact. 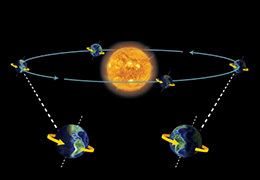 Investigate Earth's orbit, rotation, and tilt, and what causes night and day and the seasons. Explore our solar system and how Earth fits into it. Student groups investigate what adding air does to the weight of a balloon. Student groups make tennis ball globes to see how a flat map corresponds to spherical Earth. Students practice identifying oceans and continents on a map and pinpoint locations of images from the Sally Ride EarthKAM Image Gallery. Students read about a geographer and do two activities. From space, it's easy to see why Earth is called the Blue Planet. More than 70 percent of Earth's surface is covered with water. That liquid water is what makes our planet a livable place. And nearly all of that water is in the deep saltwater oceans. The oceans are home to much of the life on our planet. The rest of Earth's surface is land. Like Mars and Venus, Earth has mountains, valleys, and deserts. But mountains on Earth are covered with green forests. Valleys may have rivers running through them. And even deserts are alive with plants and animals. 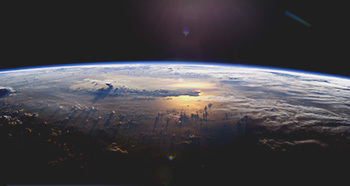 Wrapped around Earth is a thin blanket of air called the atmosphere. The air that makes up the atmosphere is mostly nitrogen and oxygen, with small amounts of other gases. The atmosphere is Earth's space suit. It gives us air to breathe and shields us against harmful ultraviolet light from the Sun. Certain gases in our atmosphere, including carbon dioxide and water vapor, trap some of the Sun's heat before it can bounce back out into space. This trapping of heat—called the greenhouse effect—keeps Earth warm enough for life. The millions of kinds of living things that call Earth home all live in the biosphere—Earth's life zone. And throughout Earth's biosphere, living and nonliving things are constantly interacting. Water moves between the oceans, land, air, and living things. Carbon dioxide and oxygen cycle between producers and consumers. The organisms in Earth's many ecosystems interact with each other and with their surroundings. These complex connections keep Earth a comfortable home for us and for all the other living things on our planet. Student groups explore orbits by observing the movement of an object swung in circles on a string. Student groups use a lamp and a globe to model the effects of sunlight striking Earth. Pretend you could zoom off in a spaceship and look back at Earth. If you watched long enough, you would see that our round planet spins, or rotates, like a top. If you took out your stopwatch, you would notice it takes 24 hours for Earth to spin around once on its axis. Twenty-four hours—does that sound familiar? Yes, that's what we call one day. Your friends back on Earth see the Sun rise in the east, climb across the sky, and set in the west. You could contact them from your spaceship to let them know that the Sun only appears to move across our sky. It's the spinning Earth that does all the moving. For the part of the spinning Earth that faces the Sun, it's daytime. For the part that faces away from the Sun, it's night. Earth doesn't just spin in place. While it's spinning, it also slowly travels around the Sun. The path it follows around the Sun is called its orbit. Earth is held in its orbit by the Sun's gravity, and it takes 365 days to orbit the Sun. That probably sounds familiar, too. That's what we call a year. 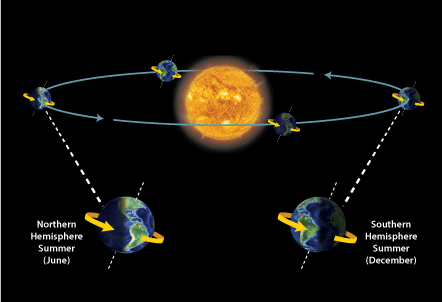 Earth stays about the same distance from the Sun throughout its orbit. So why are some parts of the year warmer than others? Why are there seasons? It's all in Earth's tilt! Earth's axis doesn't point perfectly up and down. So when Earth spins like a top, it spins like a tilted top. The seasons change depending on where you are on our tilted Earth—and where Earth is in its orbit. For the part of the year when the North Pole tilts toward the Sun, the northern half of Earth gets lots of direct sunlight. Ah, warmth! Meanwhile, the southern half gets less direct sunlight. Brrr! So it's northern summer and southern winter. Just half a year later, it's the South Pole's turn to tilt toward the Sun. The seasons flip-flop. It's now southern summer and northern winter. 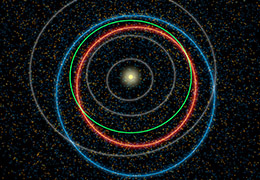 Students calculate distances from Earth to other planets in the solar system and determine how long it would take to send messages over those distances. Students figure out distances in a scale model of the Earth, the Moon, and a communications satellite. Students read about a planetary scientist and do two activities. Earth and its neighbors in space all share the same Sun. The Sun is so big that its gravity holds our vast solar system together. 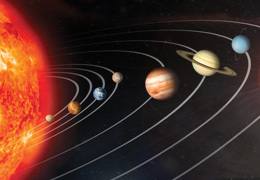 Gravity keeps eight planets and their moons, a handful of dwarf planets, hundreds of thousands of asteroids, and millions of small icy objects circling the Sun. Our Sun is a star, and like other stars, it is really a big ball of hot gas—mostly hydrogen and helium. Our Sun generates all the light and heat that brighten and warm Earth and the rest of our solar System. 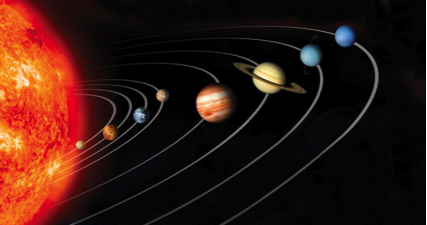 The four planets closest to the Sun—Mercury, Venus, Earth, and Mars—are called the inner planets. Each is made mostly of rock and has a solid surface. The four planets beyond Mars—Jupiter, Saturn, Uranus, and Neptune—are much bigger than the inner planets. They have solid centers, but their outer layers are made of gas. Earth, the third rock from the Sun, is very different from every other place in our solar system. Our planet is special because of its deep blue oceans. Water makes Earth a living world. And so far, Earth is the only place in our solar system where we know life exists. 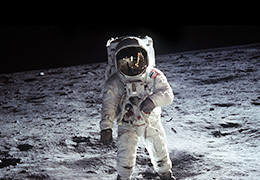 Find out about space exploration, from robotic probes to spacecraft carrying people. How high up is the ISS, and how much of Earth can we see in Sally Ride EarthKAM photos? How have people affected our planet? Investigate the different ways that human activities are changing our planet. Students calculate their age on different bodies in the solar system and apply their findings to understanding differences in planets' orbits. Students read about a mechanical engineer and do two activities. For most of human history, we didn't have the technology to explore the other planets. Scientists had thousands of questions. What are these worlds like? Did life develop anywhere in the solar system besides Earth? If it did, does it still exist? But the answers had to wait. A little more than 50 years ago, engineers developed the technology to launch rockets carrying spacecraft that could venture into the unknown. Since then, robotic spacecraft have visited every planet in our solar system and taught us most of what we know about those planets. They've even discovered places where primitive microscopic life might exist. It is so hard to send people into space that in all the history of space travel, astronauts have only landed on one other place in our solar system. The Moon is the closest object to Earth, and it is the only place humans have visited. It's still a long, hard journey—it takes three days. 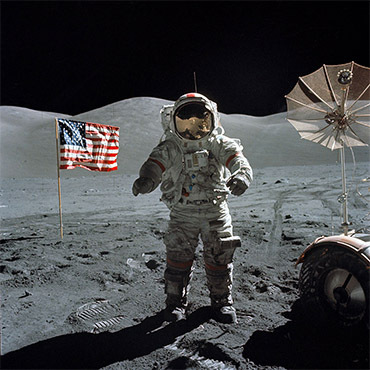 Only 12 people have ever set foot on the Moon. For now, astronauts continue to explore space—and Earth—from the International Space Station (ISS). The ISS is expected to play an important role in future efforts to revisit the Moon and to land humans on Mars. Student groups see how a faraway view of objects can reveal what they can't see close up. What Can We See in EarthKAM images? In this whole-class activity, students compare a world map to EarthKAM images to find out what they can see in different kinds of Earth images. Students read about an astronomer and do three activities. Distances in space are so vast, they're hard to imagine. 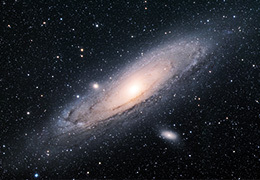 Light, the fastest thing in the Universe, takes more than 4 years to get to the closest star outside our solar system. And even within our solar system, distances are immense. Suppose you were on a spacecraft traveling at 5,000 kilometers (3,106 miles) per hour. It would take you a little over three days to get to the Moon, our nearest neighbor. That's a distance of 384,400 kilometers (238,606 miles). Now suppose you could fly to the Sun without being burnt to a crisp. At the same speed, it would take you more than three years to cover the distance—149,669,000 kilometers (93,000,000 miles). Compared to our distance from the Sun or Moon, we're really close to the International Space Station (ISS). It is in what is called a low-Earth orbit. 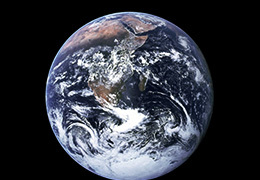 The diameter of Earth is almost 13,000 kilometers (8,000 miles). The altitude of the ISS varies, but it averages 416 kilometers. That means Earth's diameter is more than 30 times the distance from Earth to the ISS. Here's another way to envision a low-Earth orbit: If the Earth were a peach, the typical ISS orbit would be just above the fuzz. You may have seen images of Earth taken by astronauts on the way to the Moon or on the Moon. In those images, you can see all of Earth. Images from the Sally Ride EarthKAM camera don't show the entire planet. That's because the ISS's orbit is not high enough to capture that view. How big is EarthKAM's "footprint"? EarthKAM's "footprint"—the area you can see in an image—varies depending on how high the space station is when the image is snapped and what lens the EarthKAM camera is using. Images captured with the camera's 50-mm lens from an average orbit show an area 188 by 126 kilometers (117 by 78 miles). That's a little bigger than the state of New Jersey. Images captured with the 180-mm lens show an area 57 by 38 kilometers (35 by 22 miles). That's about half the size of Rhode Island. The amount of detail you can see in images from the 180-mm lens will be different from what you can see in images from the 50-mm lens. The lens size is listed under Image Properties for each image. You will discover that a closer view is better for seeing some of Earth's features, while a more distant view is better for other features. In this whole-class activity, students investigate how much of Earth's water is drinkable. Student groups analyze satellite photos of Lake Chad and infer what has caused changes in the lake. Students read about a climate scientist and do two activities. We humans are rightly proud of what we've achieved. We've created farming methods that feed billions of people. We've invented cars, trains, and planes. We've developed technologies that illuminate the night, and bring music, TV, and the Internet into billions of homes. But our successes have not come without consequences. Increasingly, our activities—from heating our homes to increasing the yields on our farms to making fast food even faster—have affected Earth's water, land, and air. To a person standing on the ground, our air seems to go on forever. From space, though, it's obvious how little air there really is. In the last few decades, we have started to change our thin blanket of air. Some of the changes, like smog hovering over cities, are visible even to astronauts in space. Others are invisible to the eye but are easy to measure. One of the most serious is the warming that we now know is caused by human activities. When sunlight strikes our planet, the ground heats up. The warm ground radiates heat into the air. Most of the gases in our air, like oxygen and nitrogen, let the heat escape straight out into space. 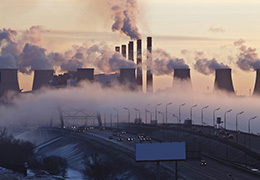 But certain gases—including water vapor and carbon dioxide—trap some of the heat. This is the greenhouse effect. Without those gases, Earth would be a frozen world. When we burn fossil fuels, such as coal, oil, and natural gas, to power our activities, we add more carbon dioxide to our air. And it doesn't just disappear in the sky. As carbon dioxide builds up in the atmosphere, it adds to the greenhouse effect. That's warming our planet. Earth's average temperature has risen about 0.8°C (1.5°F) over the last century. We're already seeing the effects. Arctic sea ice, mountain glaciers, and Antarctic ice sheets are melting. The oceans are warming. As the warming water expands, sea levels rise. Weather patterns change. Dry parts of the planet are getting even drier. Rainstorms are becoming more ferocious. The view from space makes it clear just how much water Earth has. With so much water on hand, we shouldn't have to worry about conserving it, right? The problem is that ocean water is too salty to drink. Living things need fresh water to survive, but only a small fraction of Earth's water is fresh. And most of that is locked up in ice sheets and glaciers. When people add poisonous chemicals and sewage to water, it's no longer safe to drink. The more pollution people add, the less clean, usable water there is to go around. What once seemed like an unlimited supply can suddenly run dry. Learn about the International Space Station and how Sally Ride EarthKAM got started. Follow a Sally Ride EarthKAM mission from beginning to end. Practice identifying and investigating Sally Ride EarthKAM images. In this whole-class activity, students study and discuss some of Sally Ride's favorite images of Earth from space. Students read about an astronaut and do two activities. Have you ever thought about what it would be like to visit the International Space Station (ISS)? This huge science lab in space is home to crews of astronauts and cosmonauts. The project started in 1998 when 15 countries agreed to work together to build the ISS. U.S. and Russian rockets carried ISS modules into space. Then space shuttle astronauts helped to put them together. The space station took 13 years and cost more than $150 billion to build. The ISS orbits Earth at an average altitude just over 400 kilometers (248 miles) and a speed of 28,000 kilometers per hour (17,500 miles per hour). It completes an orbit every 90 minutes. Including its solar arrays, the station is big enough to cover a football field from end zone to end zone. The ISS has room for a crew of six, plus visitors. Aboard the ISS, astronauts conduct experiments in biology, physics, astronomy, meteorology, and many other fields. 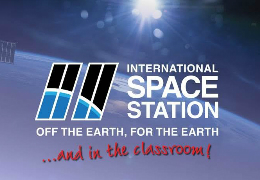 Educational activities are a big part of the space station's mission. The EarthKAM camera has been on the ISS since 2001. In addition, scientists use the space station to study how astronauts are affected by living and working in space. People have been living on the space station every day since the since the first crew arrived in 2000. The lessons learned from the ISS will be important for future efforts to explore the Moon and to land humans on Mars. One important lesson is that scientists and astronauts from different countries can work together as a team. Russian and U.S. officials agree that many countries will have to cooperate and contribute if we are going to send people to Mars. 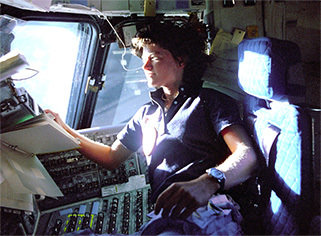 When Sally Ride became the first American woman to soar into space, she got a chance to look back at Earth from the window of the space shuttle. She was amazed by the view of our beautiful blue planet wrapped in its thin blanket of air. Sally realized how important it is for all of us to take care for our fragile home in space. She wanted to share that view with young people all over the world. That gave Sally an idea—If NASA put a camera in space, students could snap images of different places on Earth. Sally started the program in 1995 and called it KidSat. The KidSat camera flew on three space shuttle flights. 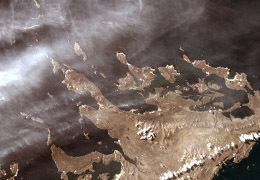 In 1998, the program was renamed EarthKAM. The EarthKAM camera flew on two more shuttle flights before moving over to the International Space Station in 2001. Sally died in 2012, and in 2013, NASA renamed the program Sally Ride EarthKAM. Today the Sally Ride EarthKAM camera supports about four missions a year. During missions, middle school students around the world direct the camera to capture images of specific locations on Earth. See how information flows during an EarthKAM mission. 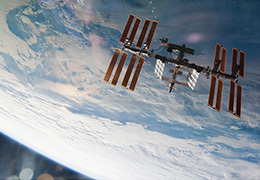 Student groups investigate the ground track of the International Space Station's orbit. Students read about different aspects of world maps, including latitude and longitude. Students play a game where they use latitude and longitude to find "treasure" hidden by an opponent. Students read about a geologist and do two activities. What is Sally Ride EarthKAM? Sally Ride EarthKAM is a NASA program that lets students and teachers around the world explore Earth from space. EarthKAM stands for Earth Knowledge Acquired by Middle school students. During three to five missions each year, students submit requests to have a digital camera aboard the International Space Station (ISS) capture images of specific places on Earth. Who runs Sally Ride EarthKAM? Sally Ride EarthKAM is a NASA program administered by Sally Ride Science. Sally Ride, the first American woman in space, started the company to inspire girls and boys to become scientifically literate and to explore careers in science, technology, engineering, and math (STEM). The Sally Ride EarthKAM Mission Control Center is at the University of California, San Diego (UCSD). UCSD students support all Sally Ride EarthKAM missions. How does a Sally Ride EarthKAM mission work? A teacher starts by signing up for a mission on the Sally Ride EarthKAM website. Students use their class's Mission Account to pinpoint locations and request images. To figure out where and when to request images, students can track the orbit of the ISS, refer to maps and atlases, and check weather reports to see if clouds are likely to be in the way. UCSD undergraduates at the Sally Ride EarthKAM Mission Control Center collect image requests from schools all over the world. NASA representatives at Johnson Space Center in Houston uplink the requests to a computer on the ISS. This computer sends the requests to the digital EarthKAM camera. Then, when the ISS is passing over the exact right spot on Earth, the camera snaps a picture. The images are sent back to the ISS computer and downlinked to Johnson Space Center. From there they are transmitted to NASA's Jet Propulsion Laboratory (JPL) in Pasadena for processing and then sent to the Sally Ride EarthKAM Mission Control Center. Within hours, the Sally Ride EarthKAM team puts the images on the EarthKAM website. Students can investigate the images and make connections to subjects they are studying. The ISS takes about 90 minutes to orbit Earth. It spends half of each orbit in daylight and half in night. EarthKAM images can only be captured during the part of the orbit that is in daylight. The ISS goes around and around our planet, retracing the same path in space. While the station is repeating its path, Earth rotates underneath it. This means the ISS passes over a slightly different slice of our planet on each orbit. Because of Earth's rotation, the ISS's ground track—the path on Earth's surface over which the station passes—moves a little to the west with each orbit. Students can request images all along this changing ground track. Students investigate an EarthKAM image to find its location, orientation, and scale. 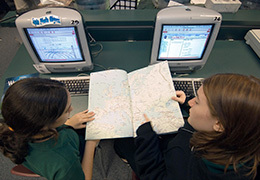 Students play a bingo game that lets them compare Earth images from different vantage points. Students read about an imaging scientist and do two activities. Many of the astronauts who have looked down on Earth from space have been surprised by the beauty of our planet. The images captured with the Sally Ride EarthKAM camera let you share that awesome view. Before you start investigating an image, take a moment to appreciate a unique glimpse of our amazing planet. If the image is one you requested, you already know where it was captured. If not, you can figure out where an image was taken. Each image has Image Properties information showing latitude and longitude. Look up the latitude and longitude on a map to find out where the image was taken. The next step is to figure out which way is north in the image. In maps, north typically is at the top. When the International Space Station (ISS) orbits Earth, though, it does not have a precise north-south or east-west orientation, so north is not necessarily at the top of an image. Try to match features in the image to features on the map you are using. This will allow you to turn the image until you find the correct orientation. Then you can compare your image to the map to identify features such as mountains, rivers, bays, and cities. The scale of EarthKAM images varies depending on the camera lens used and the altitude of the ISS orbit. The map you used to figure out the orientation of your image has a scale. Pick two points on the map and use the scale to determine how far apart those points are. Then measure the distance between those two points on the EarthKAM image. Use that information to figure out the scale of your image. Once you have identified the location, orientation, features, and scale of your image, investigate the image in greater detail. Think about what information the image conveys. EarthKAM images may help you understand the processes of geological change. They may reveal the effects of human activities. And they may let you see how Earth's oceans, land, and atmosphere interact. Identify questions to investigate. If your image shows a river, you might find out where the river originates, what its tributaries are, and what terrain it flows through. You can look for evidence of erosion caused by the river. Each image will suggest different questions for you to investigate. Encourage students who want to learn more to read about different aspects of orbits, including orbital mechanics. Lessons from space, ISS research, and the latest ISS news. Encourage students who want to learn more about orbits to read about these different aspects of orbital mechanics. The International Space Station (ISS) travels in orbit around the Earth. The modules that make up the ISS were lifted into space by the space shuttle and its rockets as well as by Russian Proton and Soyuz rockets. The space shuttle's rockets had to lift the space station modules above the atmosphere and then get them moving fast enough in the right direction so the modules and the shuttle would stay in orbit after the rockets burned out. Astronauts then put the modules together. It took 13 years to complete the ISS. The ISS is held in orbit by the pull of Earth's gravity. Gravity makes the ISS continuously fall toward Earth. As it is falling, though, the ISS is traveling so fast toward the horizon that it always misses hitting Earth and instead "falls around" our planet. The ISS is in orbit an average of just over 400 kilometers (248 miles) above Earth. It goes around and around our planet, retracing the same path in space. While the space station is repeating its path, the Earth rotates underneath it. This means the ISS passes over different parts of our planet on each orbit. The Earth makes one complete turn every 24 hours. During this time, the ISS passes over a lot of our planet. That is why the EarthKAM camera is able to capture images of so many different places on Earth.